This article posted here with permission, from Greenmedinfo.com, written by the founder, Sayer Ji. For more news from them, you can sign up for their newsletter here. What comes to mind when you think of toxic waste disposal? Biohazard suits, lead-lined vaults, and burial deep underground? You might be shocked to learn that a dumping ground for these chemicals is a product that many people consume daily to ensure good health – and it may be in your medicine cabinet. When it comes to dietary supplements, all products are not created equal. A label can identify the presence of a specific ingredient without indicating if it’s from a natural, bioavailable and biocompatible source, or from a synthetic, inorganic source. This is despite the fact that our bodies may not recognize these synthetic ingredients as food. When a supplement contains an ingredient that is not bioavailable, the body either will not absorb or utilize it correctly. The best one can hope for is that the substance will pass, inert, through the body. But with certain ingredients, the material from which they are extracted is highly toxic, rendering a substance that can do more bodily harm than good. With FDA-approval and cherry-picked, manufacturer-sponsored studies as “proof”, the unsuspecting public is lulled into a sense of safety regarding these practices. And these aren’t the only such hoaxes being perpetrated on the American people. As with most things in our modern world, understanding this logic requires you to follow the money trail. The economics are simple: chemical byproducts and industrial waste are environmentally hazardous and in abundant supply. This makes them both difficult and costly to dispose of properly. Selling these waste products as cheap, raw materials is a BIG win for manufacturers. And repackaging them as health supplements can be extremely profitable. One of the most popular health supplements by category is the multivitamin. Consumed by adults and children alike, multivitamins are sold as veritable health insurance. If you don’t get enough of the recommended daily allowance of essential vitamins and minerals, taking a quality multivitamin can fill this dietary gap. But not all vitamins on supermarket shelves are actually good for you. Some manufacturers source “healthy nutrients” that are toxic to the body, even in small quantities. This confounding trend is not limited to off-brand manufacturers looking to produce cheap knock-offs of “the good stuff”. Some of the most trusted name brands use ingredients that show up on global watch lists of hazardous substances we’ve been instructed to avoid for health and safety. 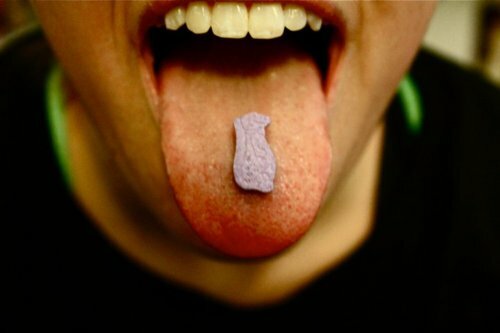 Disguised as healthy nutrients, the following toxic imposters are listed on the labels of popular multivitamins Centrum, One-A-Day, and Flintstones for Kids. As you will see, some of the biggest dangers to consumers are hidden in plain sight! Sodium selenate, a byproduct of copper metal refining, is four times more toxic than the known killing drug, cyanide. Yet, it is proudly listed as a “nutrient” in many common health products. Based on animal studies, we know that a mere 100 milligrams of the stuff are a fatal dose to most humans. The amount found in Centrum is 55 micrograms (mcg); that’s 5 mcg more than the EPA allows in a liter of drinking water before declaring it unsafe for human consumption! Organically-bound selenium is the vital human nutrient that sodium selenate can not replace. Selenium is found in foods like nuts, seeds, and organic produce grown in selenium-rich soil. This naturally-occurring trace mineral is very different than the unbound, synthetic form being put into some multivitamins. Organic selenium is known for its ability to boost the immune system, improve thyroid function, protect against heart disease, and even prevent cancer. Sodium selenite/selenate, on the other hand, has been shown to cause DNA damage associated with cancer and birth defects. Cupric oxide is one of several derivative forms of “dietary copper”, a micronutrient needed to ensure proper growth and development of bones and connective tissues, as well as for maintaining the health of vital organs such as the brain and heart. Organically, copper is found in a variety of foods, including dark leafy greens, organ meats, beans, nuts, dried fruits, nutritional yeast, as well as oysters and shellfish. The synthetic derivations found in many multivitamins are an entirely different kettle of fish! For decades, cupric oxide was the principal source of dietary copper in supplements sold for livestock and companion animals. But an array of studies conducted as far back as the 1980’s on the bioavailability of cupric oxide determined it was not fit for animal consumption. This hasn’t stopped it from being fed to humans! A summary of these studies published by The American Society for Nutritional Sciences ascertained that cupric oxide is not bioavailable due to it’s inability to permeate the gut wall. The fact that this form of copper is still being used in human health supplements and even baby formula, is particularly troubling since an estimated 61% of people in the U.S., U.K., and Canada have dietary deficits of this essential nutrient. Copper deficits are linked to heart disease, osteoporosis, and poor blood sugar metabolism, among other troubling disorders. The dangers of this supplement go beyond the nutritional deficits caused by this deceptive masquerade. Cupric oxide is listed on the European Union’s Dangerous Substance Directive as a hazardous substance, for humans and the environment. Not surprising, considering its use as a chemical in industrial applications such as the production of rayon fabric and dry cell batteries. However, it might surprise you to learn that the amount of ferrous fumarate in one Centrum vitamin is six times higher than the maximum EPA allowed limit for 1 liter of drinking water! Ferrous fumarate is an industrial mineral that is not found in nature as food. A byproduct of iron mining, ferrous fumarate has drawn even more criticism as a supplement due to its interaction with vitamin C leading to ulceration of the GI tract, chronic inflammatory diseases, and cancer. Adding to these concerns are the high doses present in many health supplements. Studies found high concentrations of iron to be associated with several pathologies, including cancer, diabetes, liver and heart disease. In addition to the offenders already mentioned, the following common multivitamin ingredients have disturbing toxic rap sheets, and are found in dangerously high concentrations in most multivitamins. In small doses, it’s known to cause side effects such as skin irritation, headache, nausea, vomiting, and fatigue. In larger doses, severe growth retardation and cancer. 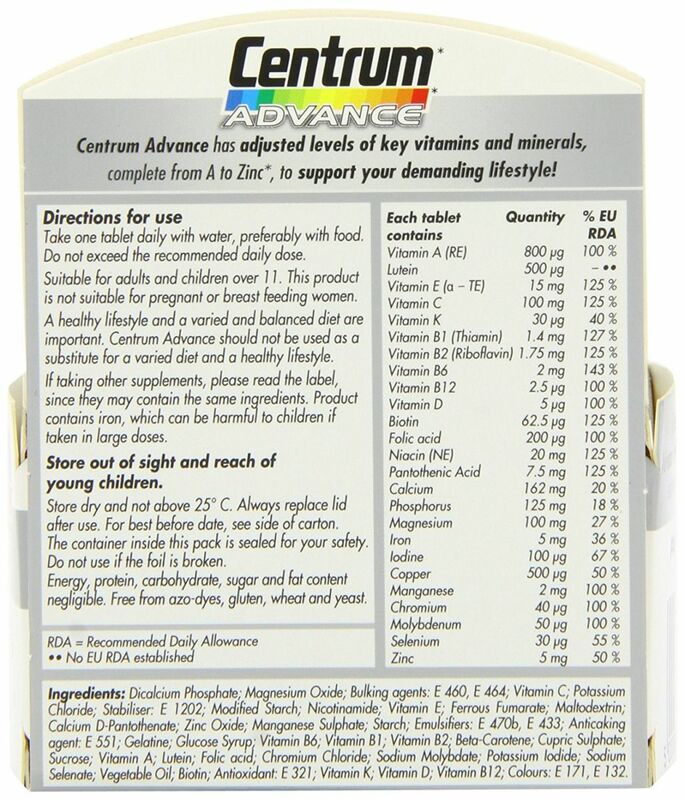 While the EPA says a mere 4 mcg is the high-end limit for one liter of water to become undrinkable, you will find 10 mcg in one dose of Centrum. Manganese sulfate is often promoted as a supplement to prevent bone loss and anemia. The organic form of this essential nutrient helps with blood clotting, the formation of bones and connective tissues, as well as hormone regulation. Found in nuts, beans, seeds, and leafy greens, manganese is considered an essential nutrient. Manganese sulfate’s other claim to fame is its pervasive use as a chemical pesticide. Even low doses of this chemical present significant neurological risk over time, as evidenced by reports of workplace exposure. Affected field workers showed loss of coordination and balance, along with an increase in reporting mild symptoms such as forgetfulness, anxiety, or insomnia. In high concentrations, this supplement becomes a neurotoxin, presenting with Parkinson’s disease-like symptoms, including tremors and permanent memory loss. So why is the standard dose in a single Centrum more than four times the EPA safe consumption limit? It should be noted that even if there aren’t extraordinary large amounts of these metals and toxicants in the vitamins you are taking, the age old justification that small amountsof chemicals or heavy metals won’t hurt you, i.e. “the dose makes the poison,” is now an outdated and disproved toxicological risk model. For instance, recent discoveries indicate that exceedingly small amounts of the following metals: “aluminium, antimony, arsenite, barium, cadmium, chromium (Cr(II)), cobalt, copper, lead, mercury, nickel, selenite, tin and vanadate,” exhibit estrogen receptor binding and stimulating properties, which has lead to them being described as ‘metalloestrogens’ with the capability to induce hormone reponse related carcinogenicity. This concept that, in some cases, the lower the dose concentration, or the lower the energy state, the higher the damage, has also been demonstrated with x-ray mammography, toxicants like glyphosate, and nanoparticles, to name but a few examples. It may seem unfathomable that these harmful, toxic chemicals could be allowed into our food and drug supply. The truth is, no one is minding the store. Loopholes abound, allowable limits are questionable, and even our organic food supply is not safe from subterfuge. Even organic infant formula can skirt regulatory oversight thanks to the numbers game. 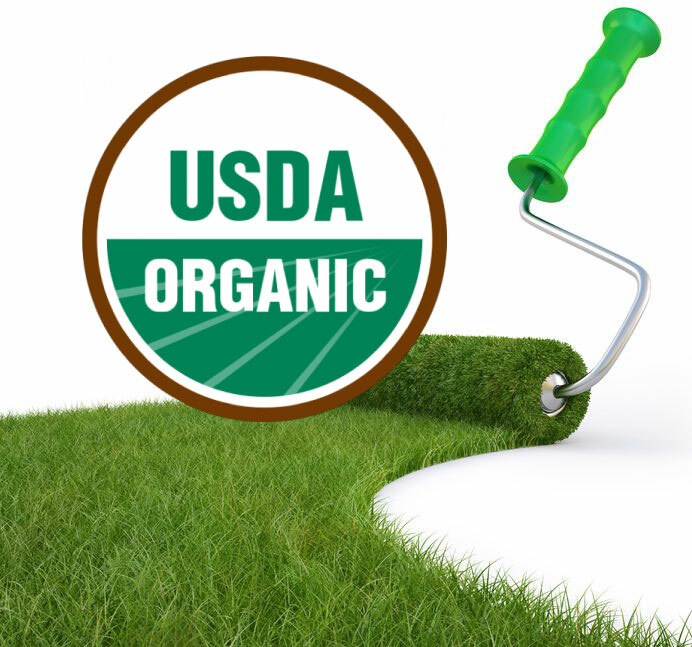 According to the USDA’s National Organic Programguidelines, any multi-ingredient product that contains 95% or more organic ingredients may be labeled organic. That means even the copper sulfate in Similac’s Advance Organicformula falls within the “contains less than 2%” ingredient list guideline, giving this noxious chemical a free pass. The public has a right to expect that any substance that is suspected of being harmful will be held to a high-level of scrutiny before it is approved for mass consumption. This basic, precautionary principle would minimize public risk until all known toxicological data has been thoroughly examined. Only when a determination that no serious health risks are present can be made, should a substance be allowed into mass-market products. However, it is essentially the reverse of this model that is in effect today. Only when a substance has repeatedly demonstrated harm in already exposed populations, is it subject to the level of scrutiny that can precipitate its removal from FDA-approved products on store shelves. This means lobbying and corporate interests often prevail through the off-loading of harmful substances that are considered “innocent until proven guilty.” Guilt, in this instance, means acute or large-scale sickness suffered by the public. Currently, no law forbids the use of any of these questionable substances in dietary supplements, despite copious laboratory research demonstrating their toxicity in animals, and significant clinical data demonstrating their actual or potential toxicity in humans. Don’t wait for the fallout to affect you before you act. Look for high-quality, organic supplements with food-grade sources, and a proven supply chain. Also consider using whole food concentrates and focusing on improving the quality of your food instead of focusing on taking supplements to try to counterbalance a deficient diet. Sayer Ji (the author) is founder of Greenmedinfo.com, a reviewer at the International Journal of Human Nutrition and Functional Medicine, Co-founder and CEO of Systome Biomed, Vice Chairman of the Board of the National Health Federation, Steering Committee Member of the Global Non-GMO Foundation.